Buckle up! You’re in for a gut wrenching, nostril-flaring ride. This is a professional’s Hot Rod - the cleanest, slickest hot rod ever. You show a high-tech see-thru rod covered with different colored spots on all four sides. The spectator chooses a number from one to six. Simply count to their number, and ask them to name the color they see. Instantly, all the spots ON ALL 4 SIDES CHANGE TO THEIR SELECTED COLOR! 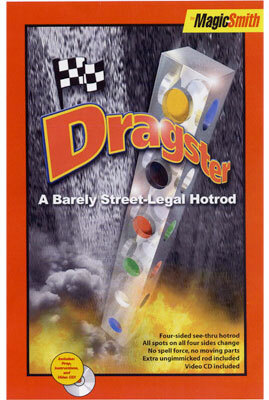 Even if you know how a regular Hot Rod works, Dragster will leave you astounded. There's no spell force, and you really count to whatever number the spectator names. This gimmick requires no more work than a regular Hot Rod, which means you’ll be ready to go in no time.